I'm making some custom commander stuff for my local game store and I need some help so lets make some commander stuff! 4 of the 6 Commanders. I’d be happy to help in ways I can! 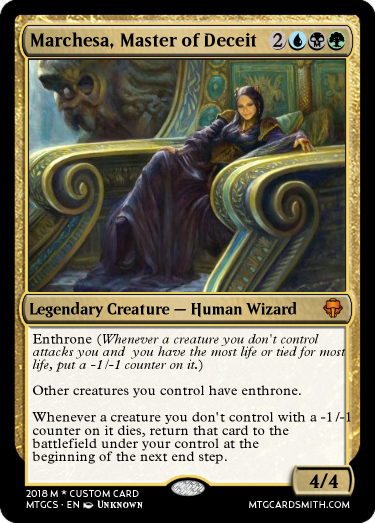 Sultai Marchesa seems excessively brutal if you can stay on top. I'd recommend having a friendly commander somewhere in there. Like, one that doesn't say "kill me now." 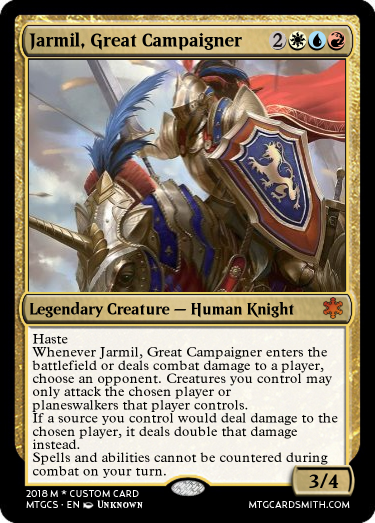 So @pjbear2005 you need us to say what the cards we make for you are for which commander deck? I think I got a couple of ideas!! Also, can we submit older cards as well? @sorinjace yes, any cards work. So can you explain the specifics of each deck's strat? I am tired and a bit preoccupied at the moment. With that I could try to find cards that could be reprinted for them. I already suggest the loyal cycle. 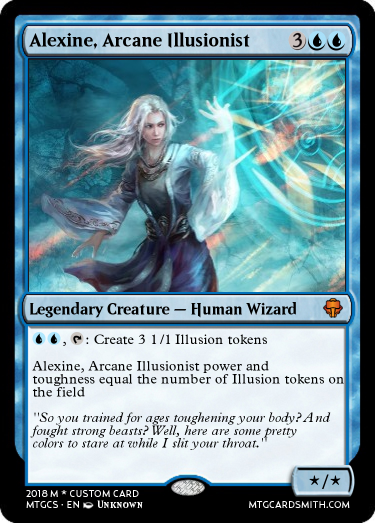 Alexine: Mono blue with mages and a lot of illusion tokens. Some enchantments. Topdeck and mill cards. Special Mechanic: Illusion- Whenever this creature is blocked exile it and put it in your hand at the beginning of your next turn. Marchesa- Unblockable creatures, -1/-1 counters, Agressive control. So we have an Esper Estrid, a swarming artificer, a Jace jr., and a conspiracy-esque queen? Have you considered, my good sir, the wonderful world of superfriends? Are you asking me or pjbear2005? 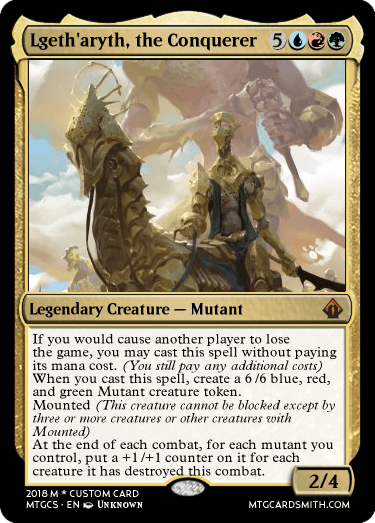 I feel superfriends has been pretty beaten into the ground thanks to Atraxa. 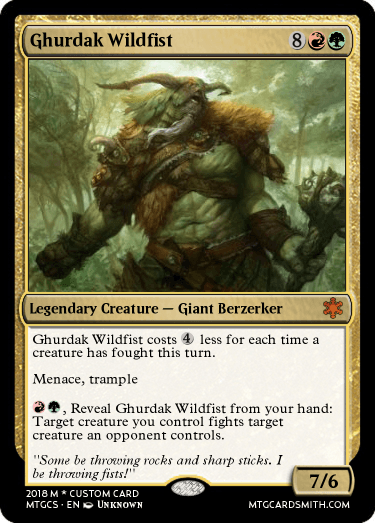 I had a "super friends"/Ally/mazes end with gatelands commander deck. It was so powerful I took out the planeswalkers, they didn't need to be in there. Then I got this reanimate scion of the urdragon deck idea and I needed the lands so I had to gut the rest of the Ally deck, but the mazes end with the gates lives on in my scion deck, I busted that out yesterday against @Dechujoh64 and @jfoster90, it ran so fast cuz I also had in my opening hand amulet of vigor and walking atlas. I'll be honest, that was pure luck. I may never see the deck run that smooth ever again, and I'm still working on it. 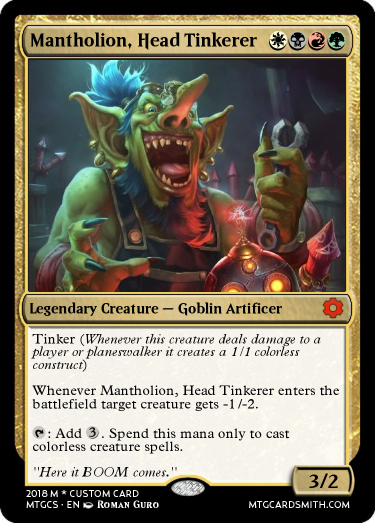 And that was against a krenko goblin commander deck and a anowan deck! @pjbear2005 take the shroud off Kari, it's pointless alongside hexproof. 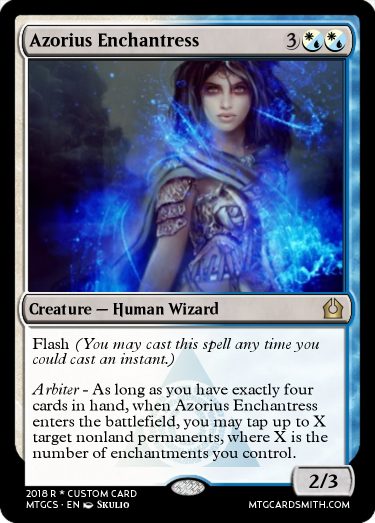 As far as spells, it should be themed towards enchantments so it should say enchantments you control cost 1 less to cast. Finally the last bit should say whenever an enchantment enters the battlefield under your control, if you cast it from your hand, you gain life equal to the number of enchantments you control.